…so near, that bullets chipped the branches overhead. 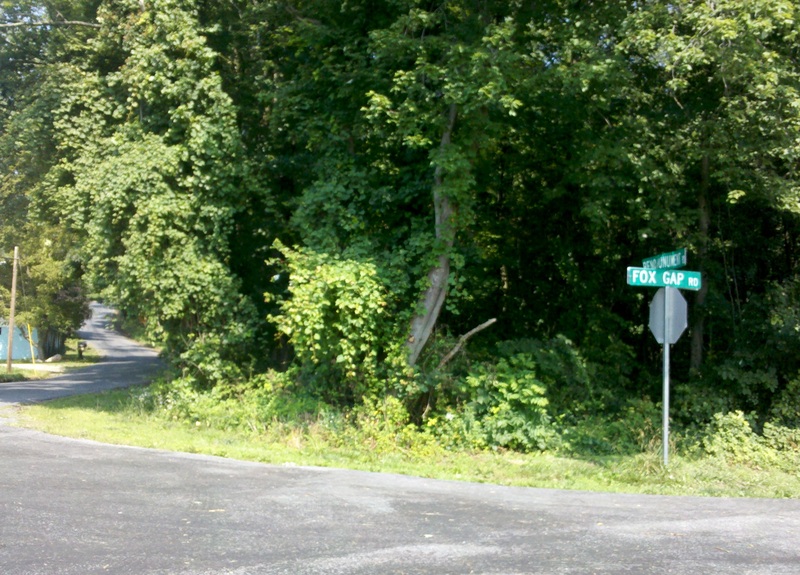 The intersection of Fox Gap Road and Reno Monument Road (Old Sharpsburg Road). The 8th Connecticut moved toward Fox Gap just to the right of this location on September 14, 1862. Sunday, September 14, 1862 dawned clear as the call of reveille awakened Oliver Case and the soldiers of the 8th CVI at daylight in their Middletown, Maryland camp site. The 8th along with the rest of McClellan’s Army had been almost constantly on the march since leaving Washington one week ago today. Today, there will be marching, but it will be different than the seven previous days. The troops rose from their slumber to the sounds of battle coming from the direction of South Mountain. The regiment hastily consumed a breakfast of “bush meal” which was likely a type of cornmeal mush possibly cooked up over the fires of the individual messes of the soldiers. Cornmeal mush was a porridge-like dish commonly served at breakfast in the nineteen century. However, soldiers in the Civil War often prepared it in situations where a day of marching or fighting was imminent. It was a filling dishing with some redeeming nutritional value that could be hasty prepared and consumed holding the troops hunger pangs at bay for a considerable period of time. With their stomachs chockfull of bushmeal and coffee, the officers of the 8th Connecticut prepared their soldiers to move out for what would surely be a day of battle judging by the intensifying cannon and rifle fire resounding through the Middletown Valley. Before engaging in battle, another road march would be required to ascend the South Mountain heights in search of the so far elusive Confederates. Throughout the morning, a heavy concentration of Union troops was moving along the National Pike and it would be late morning before Harland’s Brigade and the rest of Rodman’s Division was able to take their place at the rear of the other IX Corps units. As the regiments began to file out onto the pike, the unit and national colors snapped in the wind as rain clouds moved in from across the South Mountain range. Many of the soldiers surely thought these gathering clouds to be an ominous sign of what this day would hold in store. The rain clouds will give way to a hazy sky, but the looming reverberations of battle will only intensify as the sun rising high in the sky. Looking northwest up the Old National Pike (modern U.S. Alt 40) with Turner’s Gap on the right and Fox’s Gap on the left. Oliver Case and the soldiers of the 8th Connecticut marched out of Middletown on this road on September 14, 1862. By mid-day, the march had carried the soldiers for only about one mile past the Middletown limits when General Rodman’s Division was ordered to turn left onto the Old Sharpsburg Road. The route continued to move the units in a more westerly direction diverging from the National Pike and heading in the direction of Fox Gap. The march was sluggish with numerous halts as units bottled up along the way creating a frustrating situation for commanders and their troops alike. To the northeast, a desperate fight was underway for Turner’s Gap as well. The valley is 6 or 8 miles wide, and the National road, as it goes north-westward, crosses South Mountain at a depression called Turner’s Gap. 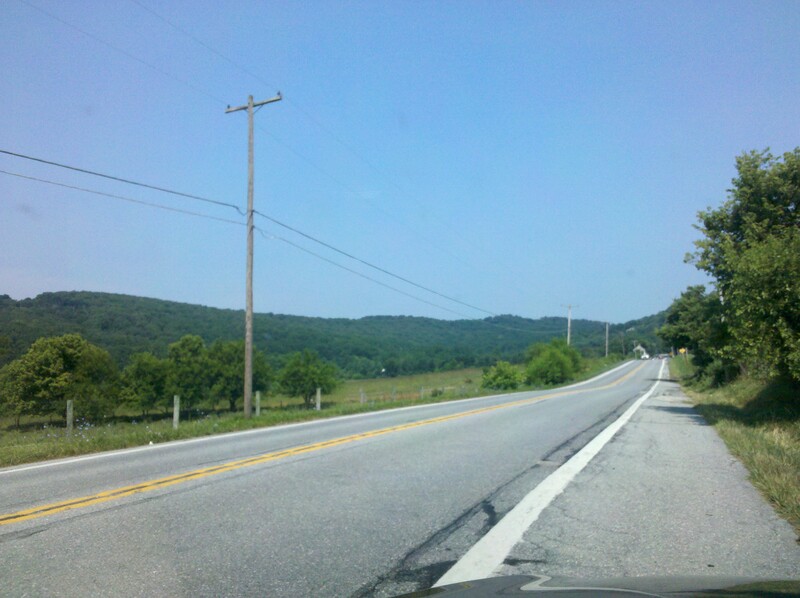 The old Sharpsburg road leaves the turnpike a little west of Middletown, turns to the left, and crosses the mountain at Fox’s Gap, about a mile from Turner’s. The mountain crests are about 1300 feet above the Catoctin valley, and the “gaps” are from 200 to 300 feet lower than the summits near them. These summits are like scattered and somewhat irregular hills upon the high rounded surface of the mountain-top. They are wooded, but along the south-easterly slopes, quite near the top of the mountain, are small farms with meadows and cultivated fields. Harland’s Brigade moved off the Old Sharpsburg Road and onto the modern-day Fox Gap Road. At this point, Oliver and his comrades could not only hear the fighting, but now they could see a great cloud of smoke rising from the woods and fields. As they moved further to the northeast and across a small stream, glimpses through the “irregular hills…meadows and cultivated fields” began to reveal a pronounced struggle between the Union attackers and the Confederate defenders at the crest. The troops of Rodman’s Division were placed into battle formations and ordered to lie down as the melee for the crest continued. The Union force engaged in the bulk of the action is the Kanawha Division commanded by Brigadier General Cox. They were the first Union infantry force to move into battle formations and up the slopes toward Fox Gap meeting the southern troops. By 9 o’clock in the morning, as Rodman’s Division is assembling for movement six miles away in Middletown, the lead regiments of the Kanawha Division are beginning to engage the Confederates on the near slope. 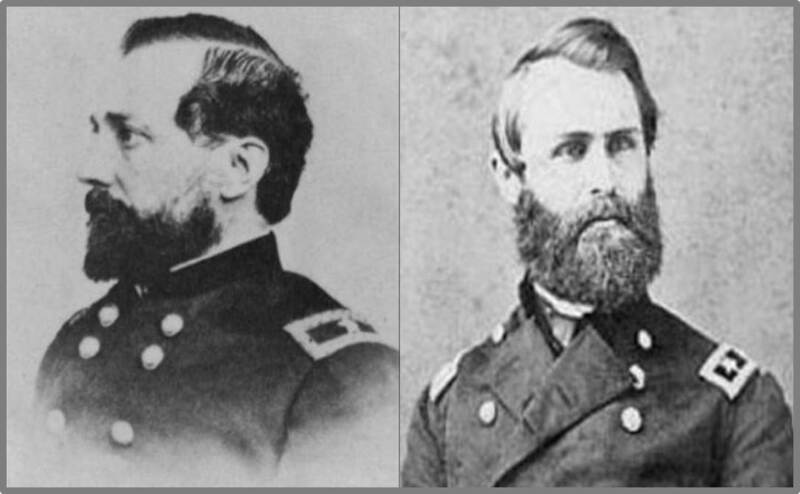 The hottest part of the early action involves the 23rd Ohio Infantry Regiment which includes among its members two future Presidents of the United States, Rutherford B. Hayes and William McKinley. Defending both Turner’s Gap and Fox’s Gap are the 5,000 troops of Confederate Major General Daniel Harvey Hill. Hill’s division is spread over a two-mile front, but a good road traverses the summit connecting the two gaps (Fox and Turner) and providing the ability to shift troops to meet developing threats. Because his forces are scattered and vulnerable, Robert E. Lee knows that he must buy time to reunited Stonewall Jackson and the other units at Harper’s Ferry with the troops of James Longstreet in Hagerstown. Lee has assigned Hill the task of fighting a delaying action that will hold McClellan in check at the South Mountain passes for at least one day. The ever-cautious George McClellan and his subordinate commanders will oblige Lee even in the face of solid evidence that the Army of Northern Virginia was divided and susceptible to being exploited. By late afternoon, the 8th Connecticut has moved into thick woods on the right of the Old Sharpsburg Road into a position supporting of a Union battery that is shelling the Confederate positions on the summit. On multiple occasions throughout the afternoon, the regiment is ordered to their feet to prepare for battle only to receive a stand down command shortly thereafter. 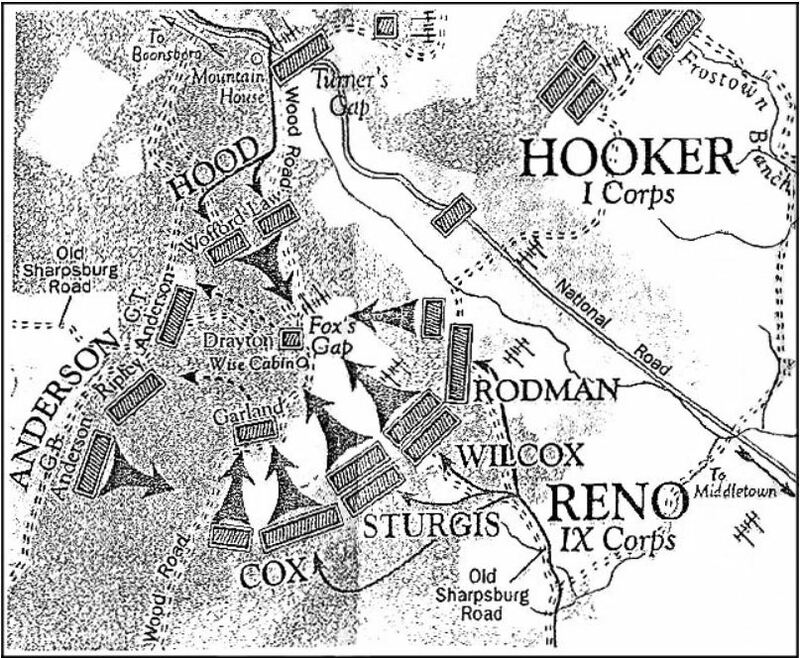 The IX Corps commander, Major General Jesse Reno, tries to manage the employment of units at the gap to gain an advantage on Hill’s thin line of troops and it appears at one point that Harland’s Brigade used in an attempt to conduct a flanking maneuver. Early on the 14th the 9th Corps moved up on the left of the Hagerstown Pike, and by noon became warmly engaged; quickly driving the enemy half-way up the acclivity. By two o’clock, the 2d Corps arrived; but the 9th kept the lead. The Eighth and Eleventh Connecticut Regiments were held in reserve, and were under fire without being engaged. At four o’clock, the whole line advanced, after a fruitless artillery contest. It was emphatically an infantry fight. Our column, pressing resolutely forward, met with strong resistance. Now the rebel line would be driven up almost to the summit; and, before the Union cheers died away, there would be a fresh crack of musketry, and our forces would recoil, while rebel yells echoed along the rocky hillside. The Union reserve was so near, that bullets chipped the branches overhead. Often the Eighth and Eleventh were called to their feet; but, when the wave of battle receded, they lay down again. Oliver Case and the 8th Connecticut come close enough to feel the bullets buzzing overhead and see the Confederate solid shot bounding through the fields and woods. But, this day, they will not directly engage the enemy. Burnside and Reno will not commit the reserve to fight at the gap. Throughout the day no engagement with the Confederates occurs for Harland’s Brigade. Silence settled over the area at around 9:00 pm and the 8th slept in their battle positions. The light of morning will begin a sight to horrible to imagine for the soldiers of the 8th Connecticut. The fighting at Fox’s Gap has been intense and both Union and Confederate soldiers have fought doggedly. On numerous occasions during the battle, Confederates are forced to reposition units to support the defense of the gaps. However, at dark, the Confederates are still holding the line at the summit. However, the rebels cannot hold the positions against one more Union attack. General Lee orders the retreat of Hill’s forces because Crampton’s Gap further to the south has fallen to the Union forces. The battle is considered a success by Lee because he has delayed McClellan by a day allowing him more time to concentrate his forces that have been divided. The victory of sorts is extremely costly for the IX Corps as Major General Jesse Reno, considered one of the finest commanders in the Union Army, is killed at Fox’s Gap by a Confederate sharpshooter. His death will have a significant impact on the operations at the Battle of Antietam just three days later. “Forcing Fox’s Gap and Turner’s Gap,” Jacob D. Cox, Battles and Leaders of the Civil War: Volume I, edited by Robert Underwood Johnson and Clarence Clough Buel, The Century Co., New York, 1887-1888. The Military and Civil History of Connecticut: The War of 1861-1865, W.A. Croffut and John M. Morris, Ledyard Bill, New York, 1868. This entry was posted in South Mountain and tagged Connecticut, Fox Gap, Harland, Jacob Cox, Jesse Reno, Middletown, Oliver, South Mountain. Bookmark the permalink.